Mode Junkie: au revoir mon amour. tomorrow, i am off to Düsseldorf to see the German Fashion Awards. sooo excited to see Andy from Style Scrapbook and Sabrina from Afterdrk!! so talk to you soon, ok? ps: don´t forget about the $100 Shopbop Giveaway that end on 6th of feb! you can join HERE! du siehst wirklich herzallerliebst aus! ah you look awesome, like a real French chic! love love love the red tights! ooh lucky you, sounds like a fun event! i love your outfit and how the colors are so bright....and love the picnic basket purse! red tights look good on you! LOVE the tights! You look gorgeous! Hi sweetheart how are you? Such a lovely look! I love the red tights a lot, like most of the girls here I guess :D! love this, so cute! great coat. What a pretty coat!! Love the tights as well. Great as always! Love this red color on You! very cute outfit, so original ! Really really cute vintage inspired look! 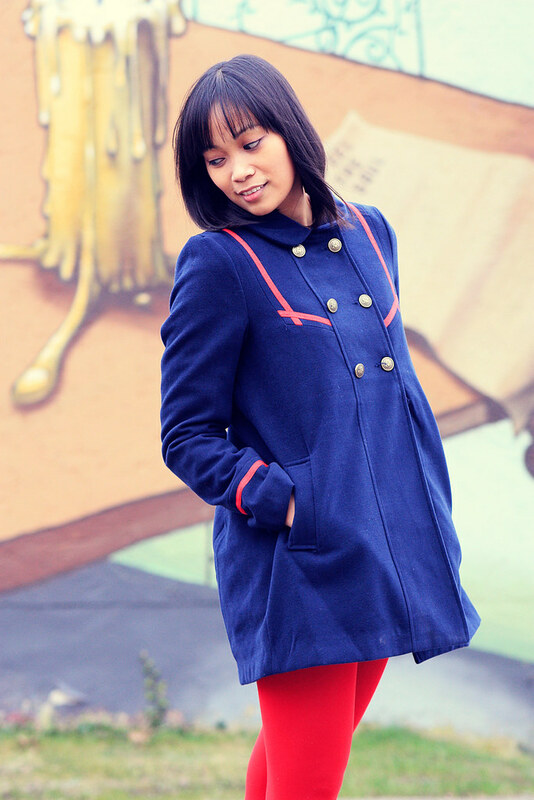 this coat is adorable, love it! I say: Bonjour mon amour!!! adorable in red & blue! If anyone can pull of red tights is you doll... you look stunning! ohh, you look so cute with shorter hair! great look. red tights rock :) have fun in Düsseldorf and say hi to the other amazing bloggers ;) I wish I could go. too. I love those tights and I wanted to get that jacket last week at H&M but they were out of my size...boo. Come by my blog and enter my giveaway. I think you'll like it. Cute outfit and you found a great background for taking your pictures! I love your coat!! Soo cute! Thx you so much. I am very touched being complimented by a so famous blogger like you. ntaw, you look so adorable! You look adorable, the red tights make the outfit for me. You always look so cute! Red tights are so great!